Weber Shandwick released Socializing Your CEO: From Marginal to Mainstream, an audit of the online presence of CEOs from the world’s largest companies. This third installment of the Socializing Your CEO series finds that CEO online engagement has increased dramatically since we first began tracking the online sociability of chief executives several years ago. As of 2015, CEOs have found their social footing. Our research finds that eight in 10 CEOs (80%) are now engaged online and via social media, a rate which has more than doubled since Weber Shandwick first began tracking the social activities of CEOs in 2010 (36%). 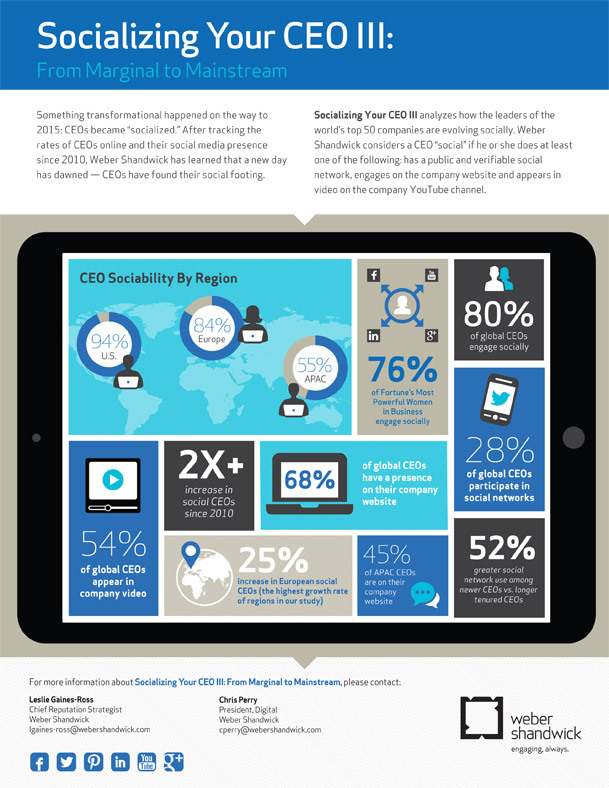 The company website continues to drive CEO sociability, with 68% of CEOs engaging through their company pages. This finding reflects the trend of companies becoming self-publishers of news and information. The research also finds that the visual influence of corporate video is fast-becoming a standard form of communication for top executives (54%) and social network usage has now hit a record high (28%). Weber Shandwick also analyzed the sociability of Fortune’s Most Powerful Women (MPW) and found that 76% of MPWs are social, rivaling the rate of the world’s top CEOs. Socializing Your CEO III: From Marginal to Mainstream provides 9 Tips for CEO Social Engagement, a series of strategies to help companies and their executives optimize their online storytelling and bolster their own company reputations and those of the organizations they run.